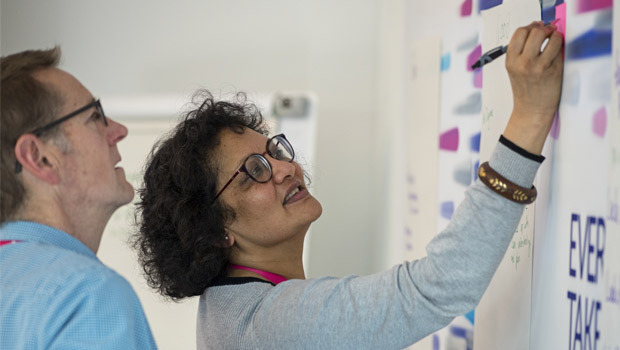 Patient involvement can improve the quality and relevance of your work, helping you better understand and articulate the benefits your research can have for cancer patients. This toolkit provides guidance, tips and templates to help you plan, deliver and evaluate your patient involvement. Once you’ve planned how you want to involve patients, we can also help you find them. Note on terminology: When we talk about involving ‘patients’ this can be applied to anyone affected by cancer and the wider public. Participation is where patients or healthy volunteers take part in research as the subject of the study. This is where research is being done to them, not with them. Clinical and social researcher rely on participants to be able to progress their research. For instance, a new treatment cannot be prescribed for patients unless it has been tested in a clinical trial. As well as testing new treatments, trials are needed to refine and improve existing ways of treating people with cancer. If you are recruiting clinical trial or research participants, you can advertise this on the CRUK Clinical Trial Database. Get in touch. Engagement is where information and knowledge about research is shared with the public. We rely on our research community to speak passionately about the research we fund, to share the progress that research is making and to inspire support. We know that to have an impact, the results of our work must reach patients and the public, fundraising supporters and the next generation of scientists. Involvement is when patients use their experience of cancer to help shape research. You can consult, collaborate or partner with patients. Involvement can add value at all stages of the research cycle. When done well, patient involvement has lots of benefits to your work. People affected by cancer can act as critical friends, improving your work by helping you understand the realities of cancer and offering new ideas and perspectives. Some research types are easier to involve patients than others. However, patient involvement has the potential to bring benefits to all areas of research. Involving patients will improve your research’s relevance and quality, resulting in a stronger funding application. Working with patients increases the relevance of research by focusing on what is important to them and will have the greatest impact for patients. Involving patients encourages ongoing discussion about the best way to approach various aspects of your research. This enables continuous reflection, challenges assumptions and improves quality. Patients can help you better understand and articulate your research's potential patient benefit and identify meaningful and impactful study outcomes. By involving patients in the research design and in the development of patient information and consent documents, you can improve the acceptability and feasibility of the study. This has been shown to increase sample donation, as well as recruitment and retention to research studies. Working with patients will highlight any ethical or sensitive issues that need to be mitigated. This will help if your research needs to go through ethics approval. Involving patients also increases transparency about how public funds are spent. Involving patients can keep your research focused on what matters most and can increase your team's motivation. By working with patients you’ll strengthen your interpersonal, facilitation and communication skills. Involvement helps raise awareness of the importance of your research. The people you involve will often become advocates for your research. They can help shape and deliver any engagement activities, helping to generate more public interest. The biggest advantage of having the patient reps is that you get instant feedback to suggestions and a much greater ability to see your research from a patient's perspective. I have changed how I view all my research proposals since I attended the event. I try to incorporate some element of patient involvement in every project I work on now. Many people affected by cancer believe that involvement is a way of giving back. They want to use their experience and knowledge to improve the lives of future patients. Getting involved gives them the opportunity to meet new people, share experiences and learn new things. Many people enjoy being able to apply skills from their work life to patient involvement. Being involved has given a new meaning to my life; it’s the best thing I’ve ever done. Cancer Research UK is committed to developing and supporting high quality patient involvement. We're increasing our focus on patient involvement in the research we fund. We support meaningful patient involvement across different types of research, where it has a clear purpose and adds value. If you’re unsure about if you should involve patients, then ask them. Working with patients to shape if and how you involve them is great practice. It helps you avoid making assumptions about what patients want to be involved in and where they can add value. For patient involvement to be meaningful and have the greatest benefits for your research we recommend you adopt the INVOLVE values and principles. The INVOLVE values and principles have been codeveloped by researchers, patients and involvement professionals to help you deliver best practice. We also recommend that you refer to the INVOLVE National Standards for Involvement and their INVOLVE top Tips when planning and delivering your involvement. Patients and members of the public looking for guidance on being involved can also refer to the INVOLVE Top Tips and the INVOLVE Starting Out Induction Pack. Use the patient involvement toolkit for researchers to learn more about involving patients in your research. Use guidelines, tips and templates to plan, deliver and evaluate your patient involvement.